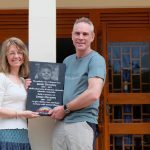 In May we visited Kagando hospital in Western Uganda for the second time, having been there for the first time in November last year. They are only just beginning to establish a mental health service. I ( Dr. Maureen) spent the morning in clinic with Robert, psychiatric nurse, and George, a clinical officer. A mix of patients with epilepsy and mental illness, most of them doing well. 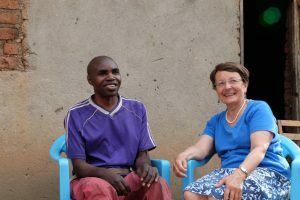 Epilepsy tends to be regarded as the remit of psychiatry in many African countries, as it is to do with the brain and there are almost no neurologists in Uganda or the other countries. 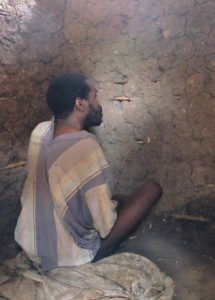 Last November we went on safari up into the hills with Fred the social worker and Seriphas the palliative care worker, and met James, now about 42, mentally ill since his twenties, and shackled in the darkness of his hut for the last 15 years. His relatives had taken him three times to the national psychiatric hospital in Kampala, a seven-hour journey in a vehicle with a disturbed adult. Each time he had relapsed. Either he run out of medication or wouldn’t take it, we don’t know. So the relatives didn’t know what else to do, apart from chain him in a hut and look after him there, as he could be aggressive when ill. I found he was very thought disordered, and he said only two things that made sense. One was to ask for food, the other was to ask for an injection. When we left, Rob, one of the doctors at the hospital, was to examine him medically then start him on a depot injection for schizophrenia. Rob has visited monthly with Robert, the psychiatric nurse, to give the injections. Again we climbed up that winding, rocky road, up to James’s village. Here we were, five months and five injections later. James was able to walk out into the sunshine, sit down and talk to me, making good sense, and expressing his hope and dreams for the future. He would like to become a teacher. That’s a transformed life after fifteen years in the darkness. Many more people across rural Africa are chained up and not able to contribute to society as their relatives don’t know that western medicine can help them return to a more normal life. The team based at Kagando hospital are finding more and more people who are permanently restrained due to their mental illness. 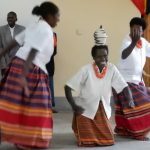 The local understanding of mental illness and epilepsy is complex, as the causes can be attributed to the influence of evil spirits or witchcraft or because the ancestors have been offended. We in the UK largely accept a medical or social model of disease, but this model doesn’t answer questions which are part of the local culture, such as why did this happen now? Did anyone else do this to me? So there is a need to work with local people and services to find ways to reach out and spread the information that mental illness can be treated with effective Western medicine and counselling. http://jamiesfund.org.uk/wp-content/uploads/2017/09/DSCF3295-734x1024-1-e1512337244253.jpg 893 640 EdwardLamb http://jf2016.dupecreative.com/wp-content/uploads/2017/08/jf-logo-2017.png EdwardLamb2017-09-28 10:35:002018-01-20 18:28:09A life transformed.